Centre Scott Williams will miss Wales' summer tour of South Africa. The 23-year-old Scarlets player has reluctantly accepted the advice of medical staff to rest the shoulder, which required surgery following Wales' 26-3 defeat by Ireland in February. "I'm gutted that I'm not going to be available but it's the best thing really just to make sure the shoulder is 100% right," Williams said. 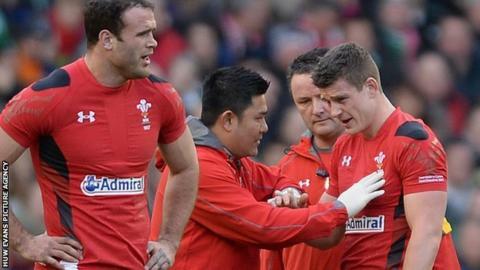 Wales now have eight players ruled out by injury and two others doubtful. Coach Warren Gatland will take a squad of 31 to South Africa in June. The 25-times capped Williams had hoped to be fit enough to play for the Scarlets against the Cardiff Blues on Saturday, 10 May but missed out because of a minor problem during his rehabilitation. "I wanted to play against the Blues," said Williams. "But halfway through [the recovery] I had a week when I irritated the shoulder a little bit and couldn't really do much for a week. "So that set me back, so we decided just to leave it for this season now and make sure the shoulder's 100% before next season so I can get a bit of form in ready for selection for the World Cup." Wales' first-choice centre partnership of Jonathan Davies and Jamie Roberts are fit to tour, but Williams would have been expected to make the match squad. Gatland will definitely be without flankers Sam Warburton and Justin Tipuric, full-back Leigh Halfpenny, hookers Richard Hibbard and Emyr Phillips, prop Ryan Bevington, lock James King and centre Ashley Beck. Scarlets fly-half Rhys Priestland, and Ospreys scrum-half Rhys Webb are doubtful for the tour. Flanker Dan Lydiate missed Racing Metro's 21-16 win over Toulouse on Friday, 9 May with a hamstring strain. However, a spokesman for the French club said the Welshman is in line to play against Toulon on Friday, 16 May. A trial match will be staged ahead of Wales' tour on 30 May, with the squads due to be announced on Tuesday, 13 May.